What day number are we on? : day thirteen. Not to be churlish, but it's in the title. Level of writer's drunkenness (in real life, scale of 1-10): You guessed it. I made it to four! It is 7:44 in the evening and I am knocking off after I finish this one, so four will be as high as I go. What am I eating (in real life again)? : Food? I am immune to food. Map or picture? : A pond in Villa Borghese. It is rowable. Any other notes/Status: This, my last one for today, is the first one where I can say I am a little drunk. As I take my last, waning sips of lemoncello, I forget to swallow, and just hold it in my mouth for an alarmingly long time until swallowing occurs to me. I hoped to do the full 36 posts today, but you may have noted that I'm a dreamer. And if you haven't noted that I'm a dreamer I don't know why, as I have been yelling it at the top of my lungs for 1,332 blog posts in a row! The exciting thing will now be not how drunk I am, but from where I am writing these posts and whether I manage to finish them before I leave on this trip. So, so, so, very exciting. I have an astonishing number of things to do in Rome on my list. There is so much art to see. So much food to taste. So much history to contemplate. So much shopping to do! But something weird happened. I woke up and all I wanted to do was go back to the tiny pond my wife took us to yesterday. 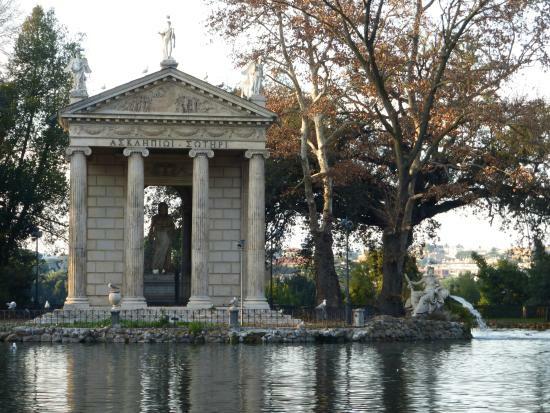 I wanted to rent a row boat and just sit in it, gazing upon the fake Temple of Asclepius. And now I am cured. We popped in at the Popolo Church. I had good informational notes for that one that I did not employ at all. The main attraction is the Caravaggios. But I have perhaps gone on a bit much over the past days regarding the wonder of Caravaggios. Although, that may be like saying: perhaps you have been over concerned with your well-being? Peter is being crucified. He looks very concerned. May I direct your attention to his arm? It is not possible to paint that. Four hundred years ago and it makes a comedy of all of photography forever. Yeesh. The Villa Borghese was the one place I didn't see. Am enjoying the posts, though, but so far not much in common in our experiences. I studied Italian before I went...that was on my mind a lot. And we were there for only a week, so. I'll keep reading. Surely we will bump into each other at some point. Well, this is fictional, but I do hope you saw some of the Palaces if you missed the Borghese, Barberini? Palazzo Altemps? Doria Pamphilj? Farnesina?